Turns out finding time to blog while in Chile was a challenge. What a shock, sitting and typing at my computer just couldn’t compete with the tug of adventure. So I took a few quick notes and decided to gather them up on the plane ride home. Welcome, then, to my “Patagonia Playback.” (Okay, it's more than Patagonia, but I liked the alliteration.) I'll be dribbling these posts out over the next week or more, so just pretend I'm still there and giving you the play-by-play. As our meetings with various environmental and government organizations didn’t begin until Monday, we had Sunday to explore Santiago. The weather was perfect so it was off to the Pre-Columbian Art Musuem just off the central plaza. Inside it was cool and provided a comfortable environment to enjoy the excellent exhibits. Maps and cultural period timelines gave context to the descriptions (Spanish and English) for each display. The museums' website might give you a feel for the quality of presentation. I was surprised to learn just how far back these civilians rose (5,000 BC by some estimates). The detailed craftsmanship of the some of the pieces was remarkable. 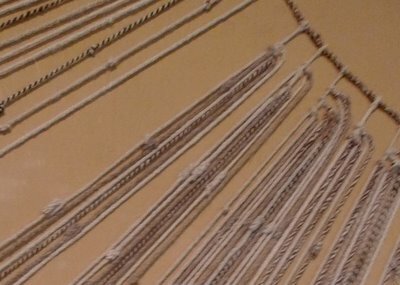 My favorite display was that of a Quipu, an artifact of the Incan civilization used to capture accounting, events, and even stories and poetry. 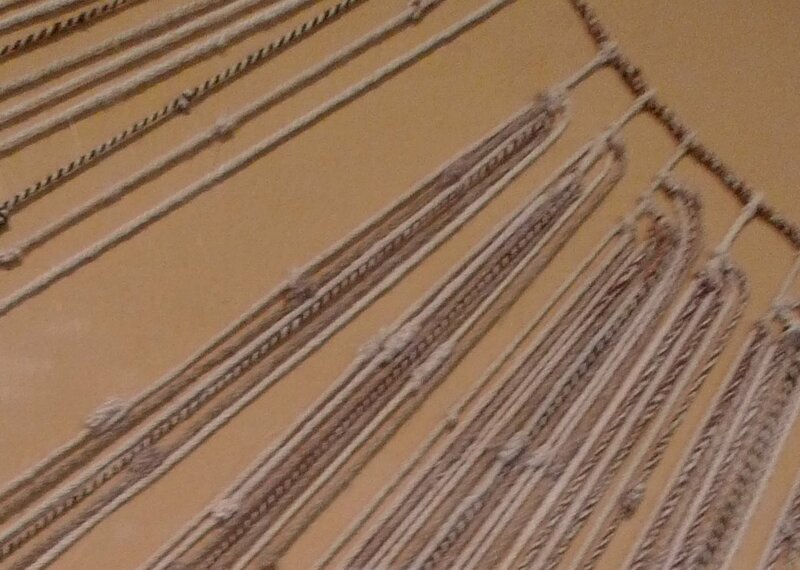 Only problem is no one has been able to translate the meaning of the knots into something we can understand. We lack, in other words, the "Rosetta String." I came to Santiago because I could. The folks from Duke's Nicholas School for the Environment invited alumni from our program to join them on their field trip to study environmental, social and economic sustainability in Chile. Without thinking hard about it, I said yes. So here I am, blogging after midnight from the lobby at the Ritz Carlton (this is Duke after all). It’s only two days in and already I’m charmed sockless. This is a new world city, mixing in art and archiecture elements of European tradition and Latin contemporary all in a spectacular landscape beneath the towering Andes. We arrived Saturday morning after a long overnight flight from Atlanta. One might think my regular sitting practice would make me good at sitting itself and one would be wrong: ugh. Not to worry, Ritz and Carlton are here to help. Complete recuperation was systematically accomplished through a morning in the hotel spa’s steam room, sauna, pool, hot tub and roof-top deck. Considering my definition of a great hotel room is one on the far side of the interstate with some distance from the ice-machine, this place has me a bit unsettled with its big feather beds, world-class spa and young, beautiful men in top hats (not named Ritz or Carlton) opening every door as I approach. Still, I’ll find a way to cope and suspect my sense of entitlement will coincide with my departing flight. Falling asleep on the deck in the bright afternoon sun, I sunk in. The fall weather here feels a bit like San Diego: bright sun, deep blue sky, a little too warm and relief in the form of an occasional breeze. Sunday we ventured out into Santiago visiting the Pre-Columbian Museum, National Art Gallery and some local markets. We had our first meetings today, including a discussion with the head of a Terram local non-profit focused on environmental policy and social justice, former Chilean President (!) Dr. Ricardo Lagos and dinner with local Duke alumni. Later in the week, we'll be heading up into the mountains for a first-hand experience of Chile's ecotourism. Our group is posting to the Nicholas School's blog so you can follow the official sustainability course there. I'll be more casual here (for I have no course credit to worry on) going deep on all of these amazing experiences, museums, markets, meetings and more, in upcoming posts. Suffice it to say for now that trips mixing education and vacation are the way to go. I’m a delighted sponge and already certain that departing flight will come too soon. Sounds really cool, Kristin. National Geographic just did an article about Santiago. I like your Blog site, very nicely done. Sounds like you are doing well. If you ever pass through Chicago look me up. Mark K.